CALENDAR FIRST SEMESTER 1960-61 September 6, Tuesday - Last date for applications for admission or transfer. September 16, Friday- Reporting date for new undergraduates who have not completed the Placement tests 1:00 p.m. September 18 Sunday - Orientation for all new undergraduates 7:30 p.m. September 19, Monday - Beginning of Registration April 4 Tuesday - Resumption of classes, 7:30 a.m. May 30, Tuesday - University Holiday, offices closed May 31, Wednesday - Beginning of Examination Week 8:00 a.m. June 7 Wednesday - Close of Second Semester classes 5:30 p.m. June 9, Friday - University Commencement 9:30 a.m. ROTC ENROLLMENT QUESTIONNAIRE NAME(Print) (Last), (First), (Middle) My choice is : Army, Air Force, Either University Number Reason for choice: I am exempt because: INSTRUCTIONS: Check only one box. See page 19 of the New Students' Handbook for directions pertaining to completion and mailing of this card. 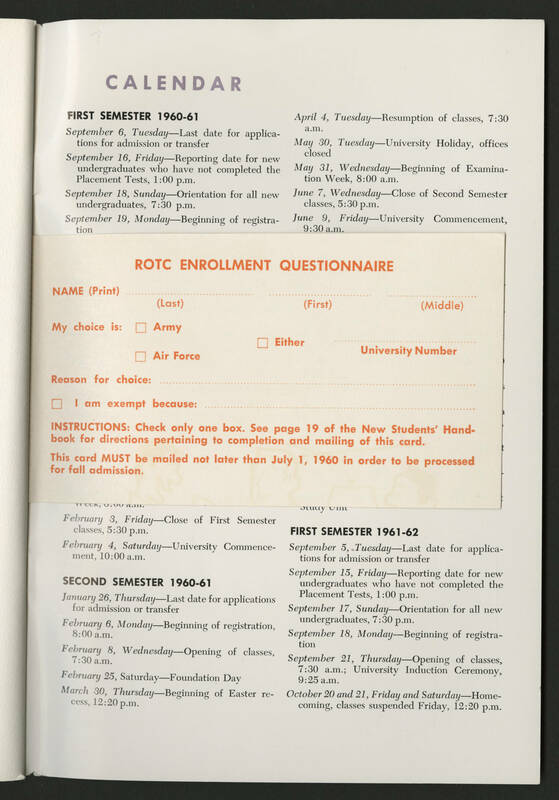 This card MUST be mailed not later than July 1, 1960 in order to be processed for fall admission. February 3 Friday - Close of First Semester classes 5:30 p.m. February 4, Saturday - University Commencement 10:00 a.m. SECOND SEMESTER 1960-61 January 26, Thursday - Lasst date for applications for admission or transfer February 6, Monday - Beginning of registration 8:00 a.m. February 8, Wednesday - Opening of classes 7:30 a.m. February 25, Saturday - Foundation Day March 30, Thursday - Beginning of Easter recess 12:20p.m. FIRST SEMESTER 1961-62 September 5, Tuesday - Last date for applications for admission or transfer September 15, Friday - Reporting date for new undergraduates who have not completed the Placement Tests 1:00 p.m. September 17, Sunday- Orientation for all new undergraduates, 7:30 p.m. September 18, Monday - Beginning of registration September 21, Thursday - Opening of classes, 7:30 a.m. University Induction Ceremony 9:25 a.m. October 20 and 21 Friday and Saturday - Home coming , classes suspended Friday, 12:20 p.m.